And the winner is… Option B! With a score of 86, Option B snagged the vast majority of votes (43 out of 40). Option A received a score of just 14 (7 votes). These results were consistent among all age groups of female test panelists. Let’s take a look at what made Option B the winner. Shoppers who aren’t immersed in the world of fitness likely don’t know what resistance bands are or what they’re for. If so, they’ll look to the product images for clarification. Many respondents who preferred Option B liked the image of the ballerina demonstrating how to use the resistance bands. They noted that it was important to see her whole body rather than just a leg so they could see exactly where to place the band. Respondents had a strong negative reaction to Option A because of the disembodied leg poking into the frame. Having a leg cut off from the body was off-putting to test panelists. “A phantom ballet leg just hanging over a product is creepy,” one respondent wrote. More of the negative words panelists used: random, weird, odd, strange, and awkward — not exactly sentiments an e-commerce seller would want to be associated with the product. Panelists much preferred the full-body picture of the ballerina in Option B over her unsettling phantom limb in Option A. Not only did the overwhelming majority of potential customers prefer Option B, but there was also a clear consensus about why. Respondents liked that the ballerina in Option B showed them how to use the product. They also had an adverse reaction to a leg without a body. Consensus results like this make the pollster’s decision an easy one. If you’re selling online, optimizing your product pages like you’ve seen in this poll helps you maximize your product listings. What are you waiting for? 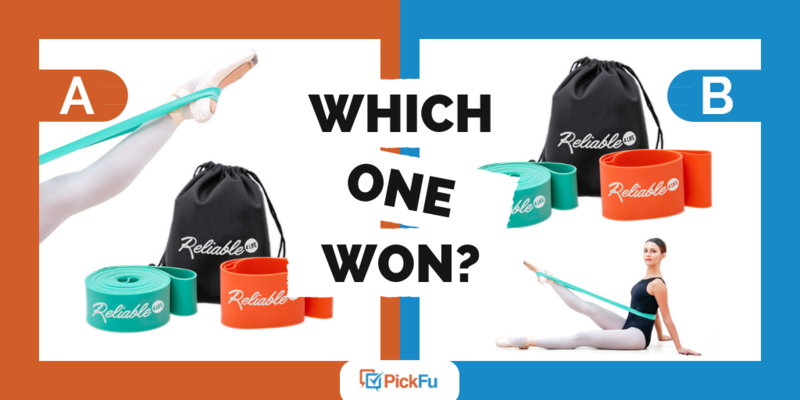 Conduct a split test by creating a PickFu poll today.